There’s nothing quite like receiving a homemade gift for the holidays, especially if it’s a gift from the kitchen. 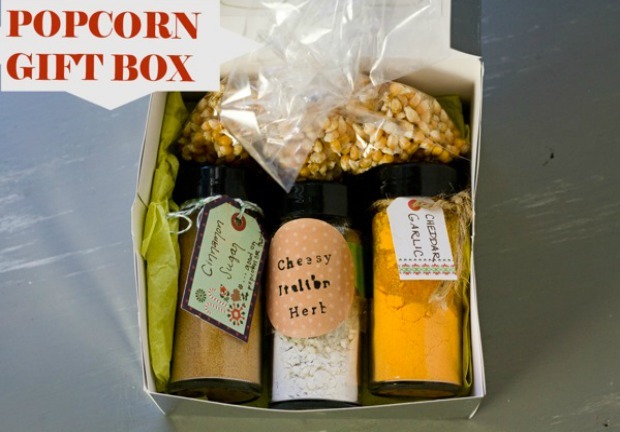 This popcorn seasoning gift set is perfect for the movie lover, sports fan, kids and adults too! 100 Days of Homemade Holiday Inspiration continues with Day 23! Each day we are inspiring you with recipes, decorating ideas, crafts, homemade gift ideas and much more! I don’t know about your family, but we love popcorn. And if we can add flavor with homemade popcorn seasoning, even better. My gift buying list is pretty long, and many of them are difficult to buy for, this year though, I know what I’m giving them, this Popcorn Seasoning Gift Set is perfect! Thanks to Julie from Savvy Eats for sharing these Popcorn Seasoning Recipes with us for our 100 Days of Homemade Holiday Inspiration!